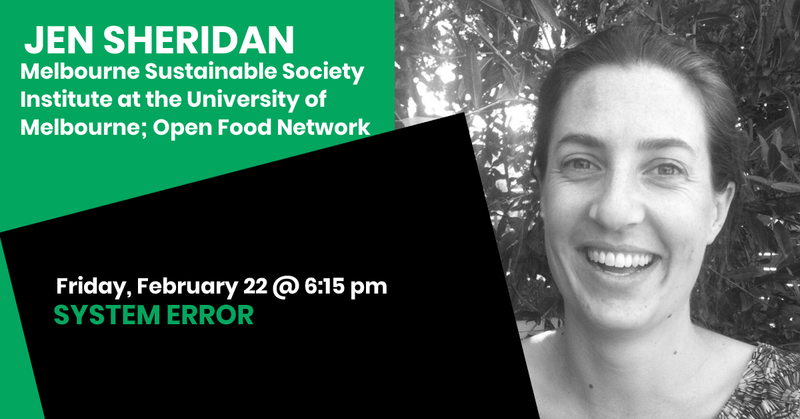 Jen Sheridan is a sustainable food systems researcher for the Melbourne Sustainable Society Institute at the University of Melbourne. She works on Foodprint Melbourne, investigating the environmental impacts of feeding the city now and into the future, and what’s required to create a resilient city foodbowl. The project has highlighted the importance of Melbourne’s city fringe farmland, and the unique challenges and opportunities the area presents. She has helped translate that research into Year 9 geography curriculum resources for the Teaching Foodprint Melbourne project. Jen is also the communications director for the Open Food Network, a not-for-profit working to transform the food system by building the tools and resources needed to create a new food system that is fair, local, and transparent. Founded in Australia in 2012, the organisation is now a global movement of locally-led organisations empowering farmers to control their own supply chain. The Open Food Network’s flagship project is an open source software platform that enables farmers to sell both directly and collaboratively through online shopfronts. The team also provides resources such as community food enterprise incubator programs, local food activations (particularly in regional areas), and consultancy services. Jen is an advisory board member for Farmer Incubator, a local not-for-profit aiming to grow future farmers. She has previously worked for the Victorian Eco-Innovation Lab at the University of Melbourne and for the Food Alliance at Deakin University, where she worked on the Know Your Foodbowl project. Jen has hosted her own radio show about growing food in Melbourne, co-founded a quarterly networking and conversation night about sustainable fair food, and helped establish the Youth Food Movement’s Melbourne chapter. She and her partner are owner-building an off-grid home in central Victoria, and working to regenerate soil and biodiversity on their degraded farmland.